I have 3 original cranks and one Indian crank I can check this weekend. That is quite strange for one part to be metric. Who would have thought? That screw locates the crank bushings. It keeps them from moving. No need to oil there. Probably not a bad idea if it has been sitting for a long time but you can accomplish the same thing by pumping the oil pump primer handle. Listen to all the poop you want it really boiled down to the states rights to buy and sell people. Actually these states were offered status quo but they declared war for the ability to bring new states in as slavery is OK states. It would be so nice if they taught the real reasons behind that war. There was so much more too it. But I digress. Everyone just wants to boil it down to one issue. Oddly enough it is the one that that is most divisive, go figure. Fixed it for you. It is 40 degrees here too, and 6" of snow on the ground. That's 153 mm. Attention span alert. Attention span alert. Attention span alert. What's a span alert? Something too wide? General Discussion / Re: How accurate is the weather forecast in your part of the world? Looks like a forklift driver spilled a couple of pallets of flywheels towards the end. 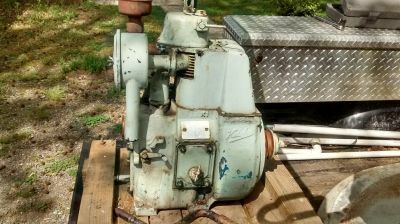 Changfa Engines / Re: What's this really worth?